The Admiral is a men's watch from Longines with an extensive history. Its newest versions have sporty, functional designs, while the numerous affordable vintage versions have a more simple, classic look. 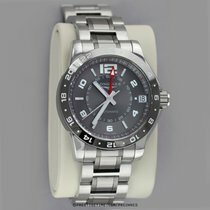 In 2007, Longines introduced their Sport Collection, comprised of the Admiral, Conquest, HydroConquest, and Grande Vitesse series. 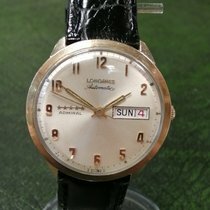 However, it wasn't the Admiral's first appearance; years earlier, the Swiss luxury watch manufacturer had offered a different range of models under the same name. 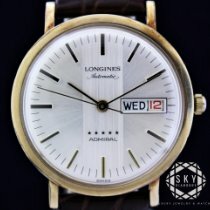 Thus, if you search for an Admiral, then you will likely find many different watches from various points in Longines' history. Admiral watches range from modern, waterproof chronographs to historical diving watches and include vintage dress watches with solid gold cases. The series is appealing to a wide variety of watch fans and as an added bonus, you won't have to spend too much on a watch from this collection. 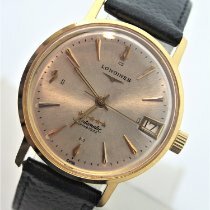 Most Longines Admiral watches are incredibly affordable at under 1,000 euros. Longines has since stopped producing the series, so new models are becoming more and more rare. The 2009 GMT Admiral is one of the most interesting newer watches in the collection. It has an additional hour hand which makes one complete rotation per day and a bezel with a 24-hour scale to display a second time zone. The Admiral GMT has a 42-mm stainless steel case. Wide, light-colored baton hour and minute hands, as well as an extra red hour hand with a white triangle at the tip, make the watch easy to read. The GMT is available with a dark gray or white dial. Newer versions typically have a bicolor metal bracelet with dark gray middle links. This timepiece's reference number is L3.669.4.06.7 and it costs around 1,800 euros. An almost identical Admiral is available as a chronograph with reference number L3.667.4.56.7. The diameter of the stainless steel case is the same as the GMT version at 42 mm. The chronograph's ceramic bezel has a tachymeter scale on it. The red central stopwatch seconds hand and small red hand on the minute counter are distinctive features of this chronograph, similar to the additional red hour hand on the GMT version. You should be prepared to spend around 2,200 euros on an Admiral chronograph in good condition. On rare occasions, you can find new models for around 2,800 euros. There are many vintage Admiral watches with solid yellow gold or rose gold cases available for around 3,000 euros. Older Admiral watches feature five stars on the dial as a distinguishing mark of the series. Simple three-hand gold watches with a date display in very good condition can be purchased for around 2,000 euros, but sometimes they go for even less. The size of these watches is true to the style of the 1960s; back then, men's watches were generally smaller, and the older Admirals have a diameter of around 35 mm. The vintage models with a diving watch design are an exception to the standard Admiral. They were produced around 1970 and are hard to miss with their large cases. Although the dial is round, the cases are oval or rectangular with rounded edges. The look of these Admiral models is very appealing to fans of watches from this time period, as the design embodies the looks of the 1960s and 70s. Using a strong blue paired with luminous orange or red was an important design trend at the time. Although the watches look like they would be suitable diving watches, most are not. Many timepieces do not indicate whether they are waterproof and even if a watch does claim to be waterproof, it is still recommended that its waterproofness is tested with a special tool by a dealer or watchmaker. These types of watches are sold for between 1,000 and 2,000 euros, and their condition and rarity are deciding factors in their price. Over the years, Longines also introduced a chronograph version of the Admiral run by the famous Valjoux 7750 caliber. The dial's tricompax layout with subdials at 12, nine, and six o'clock is a distinctive feature of this reliable mechanical chronograph movement that has been around since 1973. The day and date display are located at the three o'clock position. The Valjoux chronographs are available in stainless steel and as bicolor stainless steel and yellow gold models. Prices for these timepieces range between 1,000 and 2,000 euros. Even though the Admiral is no longer produced by Longines, a new edition of the Admiral may appear in the future. After all, the timepiece has a long history and has been reinvented many times already. 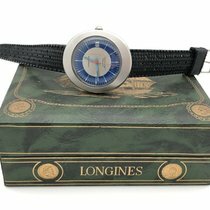 Longines is one of the oldest Swiss watch manufacturers in operation today. The company was founded in 1832 and has been part of the Swatch Group since 1983.